Charles de Lint is one of my all-time favourite authors. A master of urban fantasy, he is responsible for such masterpieces as Greenmantle, Moonheart and the much beloved The Little Country. The Little Country is a magical novel set in the fishing village of Mousehole, Cornwall, about folk musician Janey Little’s discovery of a strange book in her grandfather’s trunk. It’s one of my favourite novels, not least because it features its own original music scores in the back of the book which, until now, had gone largely unheard. I loved it so much I set off for Mousehole many years ago and tracked down the row of cottages that inspired the setting. Enter Zahatar, an acoustic string band from the US that is busy fundraising on Kickstarter so it can put out an album of distinctive arrangements of Celtic tunes from Charles de Lint’s The Little Country. We want to have the opportunity to record an album version of The Little Country song cycle, which began as single melody lines in the appendix of one of Charles de Lint’s urban fantasy novels from the early 90’s. These tunes had never before been arranged for string band in their entirety, until now. Zahatar recently held a sold-out performance of the song cycle, and recording an album is our next endeavor. Every step of the way, our project has been endorsed by Charles de Lint, and we are forever thankful to him for allowing us the rights to bring these tunes to life from the pages of his wondrous book. We love playing Celtic music, and The Little Country is a project that’s very near and dear to us. We want to share this experience with the world! If you have some pocket money, I can’t think of a better present for your Christmas stocking than this album, and maybe the t-shirt as well! 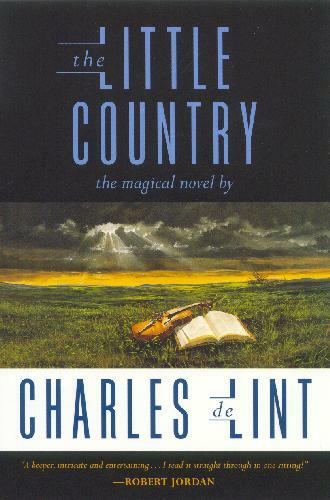 I hope the many fans of Charles de Lint’s The Little Country are drawn to support this wonderful undertaking. I know I will be.